Posted at: 12/31/2012 10:45:00 AM . 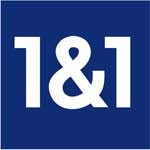 1and1 wants to help you start the year off right by offering a .com domain for only $0.99.This deal will expire tonight, December 31, 2012. This deal apparently was during the month of December but I just saw it today so it's your last chance this time. These deals are often going on so I'm sure we'll see it again. I prefer 1and1 for registering a domain because they are upfront about their pricing with no hidden fees. After the first year at the promotional rate, renewal will cost $10.99 (subject to change) but you will get an email in advance of your expiration date letting you know the price and asking if you want to renew. Those extras that 1and1 provide for free are great. Based on pricing from a competitor, email is an additional $5.99 a year and private domain registration is $7.99 per year.